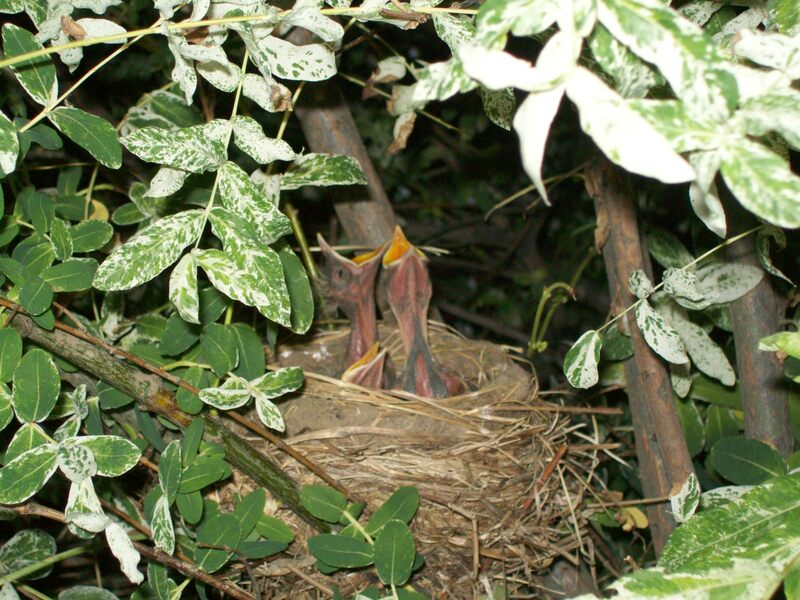 Baby Robins outside My Window – The Bookshelf of Emily J. 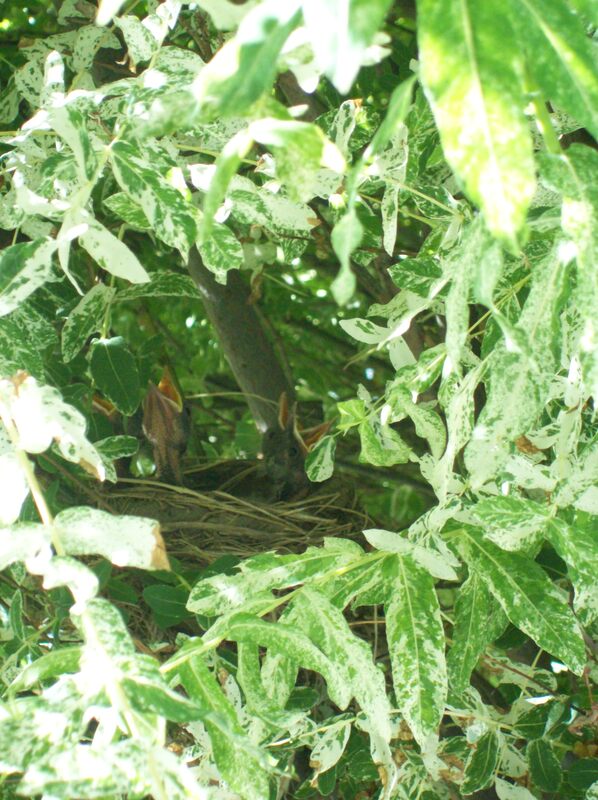 A few weeks ago we noticed a robin in its nest outside our family room window. As we sat on the couch to read or watch television, the robin would sit in its nest. During my husband’s Saturday yard routine, he sneaked a peek into the nest and saw four bright blue eggs. We hoped from that moment that they would safely hatch. Well, a few days ago, they did! Four bald and shaky heads emerged with their flat yellow beaks stretched open for some grub. We have been fascinated watching the mother and father bird care for these little ones. They have brought worms, berries, and insects. And no matter how much they bring, the babies continue to stretch and grasp for more in those adorable open beaks. My sister Ashley had a similar experience in her yard a few years ago, and posted about it here. She suggested getting a tray and some meal worms for the parents to find. I haven’t had a chance to do so yet, but my daughter and her friend spent most of yesterday afternoon flooding the garden and digging for worms in ninety-degree heat. They came up empty, but I have sneaking suspicion that Petco may have what they were looking for. We check on the baby birds several times a day. It is an amazing view of nature right outside our window. We have removed the screen for easier viewing and picture taking. However, getting a picture of the parents actually feeding the babies has been difficult, and I suspect stressful for the birds. Each time I notice from the kitchen that larger and darker presence bowed over the nest, I try to sneak over to the window with my little camera. Inevitably, the bird will dart away, probably near a heart attack. I need to stop stalking them, especially if I want to see those babies thrive through eating well and often! As we have watched, I keep checking to make sure that the babies do not fall. They are wobbly and stretch pretty far, which makes falling a real possibility. 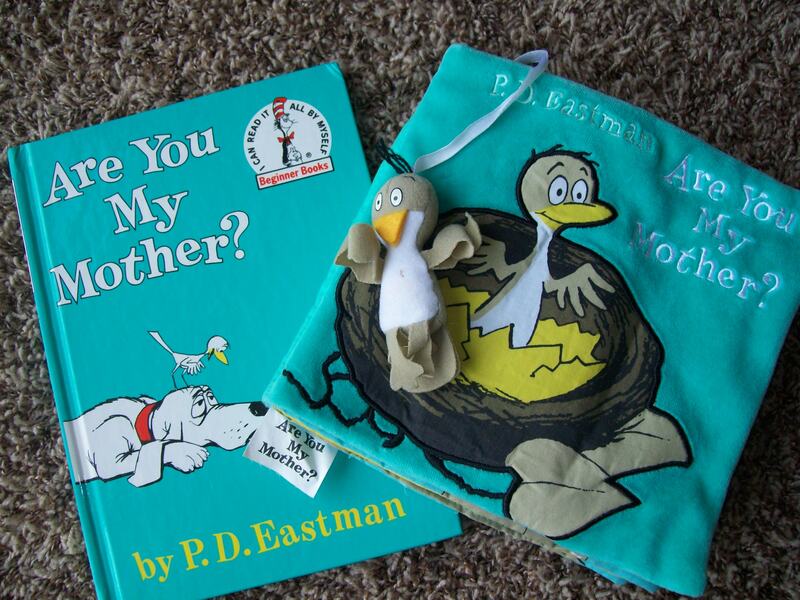 And as I worry, I can’t help but be reminded of P. D. Eastman’s classic children’s picture book, Are You My Mother? This book is not only cute and educational, but it speaks to our deepest desires as human beings to be loved unconditionally by our mothers. This is something I lack, and whenever I see other women enjoying shopping with their mothers or speaking of how much their mothers help them with child rearing, I can’t help but be jealous. And although I feel like that baby bird sometimes, wandering around asking, “Are you my mother?” I cannot feel sorry for myself. I have wonderful sisters and a fantastic brother. I have a loving father who never makes me feel dread, self doubt, or guilt. And I also have countless women in my life who have mothered me. They know who they are, but a few stand out to me particularly when I think of how I learned to be a mother. My piano teacher growing up, Kris, mothered me through music. She showed me what it was to work hard and always listened to my silly teenage thoughts. She is still a woman I admire and love. She continued to support me after I finished lessons and I moved away to college. She visited me when I had my first baby, profusely complimenting my little house and the life I had carved for myself. I learned unconditional love from her. Brenda and Kelly are the women who taught me how to be a mother in a practical way. When my first daughter was born, I had no help from my biological mother and I did not know what I was doing. I ended up depressed, overwhelmed, lonely, and confused. They came to the rescue, answering my many questions about breastfeeding, diapering, and napping and listened to me when I needed a friend. Jeri, like Brenda and Kelly, came into my life when my first daughter was born. She befriended me, threw me a baby shower, and made me feel so special in a time that proved difficult for me. I have many other “mothers” but these are the women that I remember fondly when I think of becoming a mother myself. They are the mothers I aspire to be. They give me positive examples of womanhood to follow and find comfort in. The mother bird is busy feeding and watching over her brood right now. I do not have the heart to sneak up on her again, but I am grateful for the experience of watching her mother and of being reminded of my own importance in the role of mother. Wonderful – you are so lucky! I know! There is really no way to plan something like this. We had robins one year on the top of our light right outside our sliding glass door. The kids loved watching them but it made it hard to go in the backyard, especially for my husband. The Mom and Dad bird would get really mad when he would walk out so close to the nest. They would fly at him and chirp loudly. My favorite part was when we saw the babies on the ground trying to fly. How fun, and funny that they tried to attack! I can’t wait until they are flying. It will be fun to watch. You’ve gotta love the Snort! Thanks. I am unhappy with the lighting in it, but you have to snap them quickly when a two-year-old is involved! be your own mother. Keep watching her! The robin mother is a good one! Other wise just trust yourself! You are the best mother! I loved The book as a kid, and I’ve loved reading it to my own children. What fun to have a front seat at this lovely little family story. Margaret (whose father did a lot of fishing) said that the best time to look for worms is after dark or early in the morning. You may need a flashlight. Ah ha! Thanks for the tip.